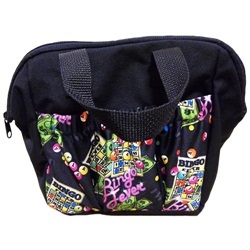 Get this stylish 6-pocket dauber tote bag with a Flashy Bingo Fever-themed pattern. This is an easy to carry dauber bag. Six pockets line the outside and are perfect to hold daubers. It also has plenty of space inside. Daubers sold seperately.